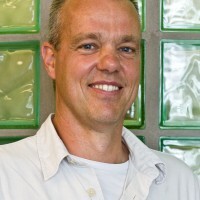 Erik Schlangen is Professor “Experimental Micromechanics” and director of the Microlab at Delft University of Technology, faculty of Civil Engineering and Geosciences. The main research topics of his chair consist of studying mechanical properties of materials to be able to understand failure mechanisms and to develop materials with improved properties. A further focus of his research is the field of chemo-mechanics which tries to study degradation due to coupled chemical and mechanical actions in materials. In 2005 he was amongst the first to develop new materials with self-healing properties. He took the initiative in developing self-healing concrete using Bacteria and he was the inventor of the self-healing Asphalt using steel-wool fibres and induction energy. He obtained a MSc-degree in Structural Engineering in 1989 from Eindhoven University of Technology and finished his PhD at the Civil Engineering department at Delft University in 1993. During his PhD he developed the Delft Lattice Fracture Model. After a two year Post-doc position in the US, he joined the Materials Research Institute Intron in the Netherlands. In 2003 he returned to Delft to join the Microlab, where he was promoted to Professor in 2012. He is author of more than 250 journal and conference publications and is very active in international research committees. He is Chairman of the Rilem Technical Committee on self- healing of cement based materials.